Ancestors of the Altaic (Turkic)-speaking Uzbeks emerged in Central Asia as early as the 3rd century B.C. when nomads - possibly Hun descendants - began invasions that continued for centuries. Turks swept through in 1 A.D., followed by wide-ranging assaults by Mongol hordes in the 13th century. Uzbek genetic studies indicate Turkic-Mongoloid ancestry - reflected by lighter skin and flat facial features - with lesser Iranian admixture. Centuries before any country borders were drawn they settled in the Uzbekistan/Afghanistan region. The group designated as Southern or Afghan Uzbek formed from waves of ancient migrations, as well as more recent ones in the 1920s-1940s from Russia when that government's atheistic policies persecuted their Islamic religion and customs. Speaking Uzbeki, their own Turkish dialect, Uzbeks identify themselves as Hanafi Sunni Muslims, although this is largely a cultural identity now rather than a religious one. 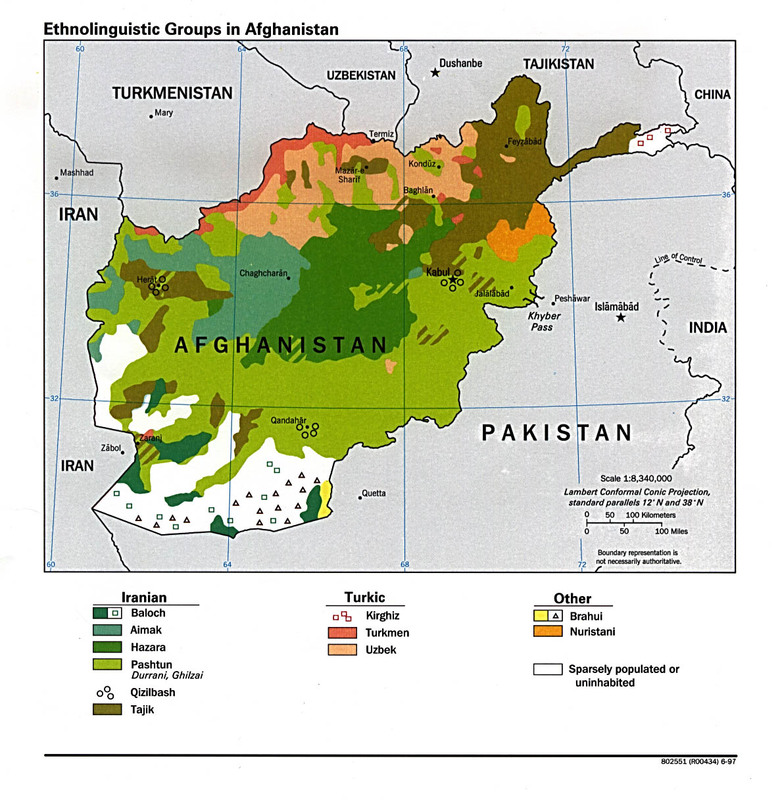 As Afghanistan's fourth largest ethnic group (2.5 million) and nearly one-tenth of her total population, Southern Uzbeks still reside primarily in mountainous northern regions, particularly the Fariab Province. They live simply in small villages, often with Tajik neighbors but are averse to the Pushtan who moved into their homelands in numbers sufficient to render them a minority by the 1960s in territory they once controlled. These high plains farmers grow grain and vegetable crops but struggle to survive. Affected by recent droughts, but spared large-scale destruction by war with Russia and the Taliban, their lives were less affected than some other groups. Area herdsmen breed the desirable karakul sheep and Turkman horse. Medical care is not readily available and economic opportunity is spare. Crafts, rugs and animal by-products are traded locally for additional income in area markets that also serve as social centers. Afghan culture has been undeniably impacted by Uzbeks, particularly in music, carpet making and sport. Buzkashi, a violent game played by teams on horseback with a headless goat carcass and now synonymous with Afghanistan as its national sport, was introduced by Uzbeks / Mongols. A creative people, Uzbeks love poetry, music and playing unique instruments, such as the Uzbek 2-stringed fretted lute. Culture is preserved through folk dances and traditional hand crafts like metal working, wood carving, leather craft and wall or textile painting. Many urban Uzbeks are businessmen, others are skilled craftsmen. Women are noted for their exquisite rugs, an area of significant contribution to Afghanistan's textile heritage. Uzbek food and dress offer interesting features. Like other Afghans, Uzbeks always serve tea and nan (bread). "Osh", a dish made with carrots, onions, oil, rice and lamb is served weekly and on special occasions. Unusual in most Afghan diets, pasta is common in Uzbek menus, probably introduced to them by Italian or Chinese traders along the Silk Road. Fruit is also a favorite. Western dress is worn by younger or city-dwelling Uzbeks although men may add a skullcap with embroidery indicative of their home region. A yoked dress worn over long pants is traditional women's attire while that of men is the Chapan - a loose, quilted cotton coat worn over a shirt and trousers, completed with the skullcap. Adopted in the 14th century, the Uzbek name is said to mean "independent" or "self-ruling", from "uz", meaning self and "bek", meaning master. The name seems fitting since the Uzbek in northern Afghanistan have remained a cohesive group, where distance from the capital city, Kabul, has allowed them some autonomy. Extended family is considered the societal core, with marriage outside the group discouraged, although allowed. Political interests are represented by a single party, even when the 2001 Allied invasion increased political opportunities for them. Uzbeks continue to champion a central government with representation for all Afghan ethnic groups, but granting broad control over local issues to the provinces. With senior representatives in the present, as well as past governments, Uzbek influence can be expected to help shape an emerging Afghanistan. * Scripture Prayers for the Uzbek, Southern in Afghanistan. * Pray that the Holy Spirit will soften the hearts of the Uzbek Muslims towards Christians. * Pray that Christians in the United States start reaching out to their Uzbek neighbors and they would be receptive for Christ's love.